This course broadens students' understanding of mathematics as it relates to managing data. Students will apply methods for organizing and analysing large amounts of information; apply counting techniques, probability, and statistics in modelling and solving problems; and carry out a data management investigation that integrates the expectations of the course and encourages perseverance and independence. Students planning to pursue university programs in business, the social sciences, or the humanities will find this course of particular interest. 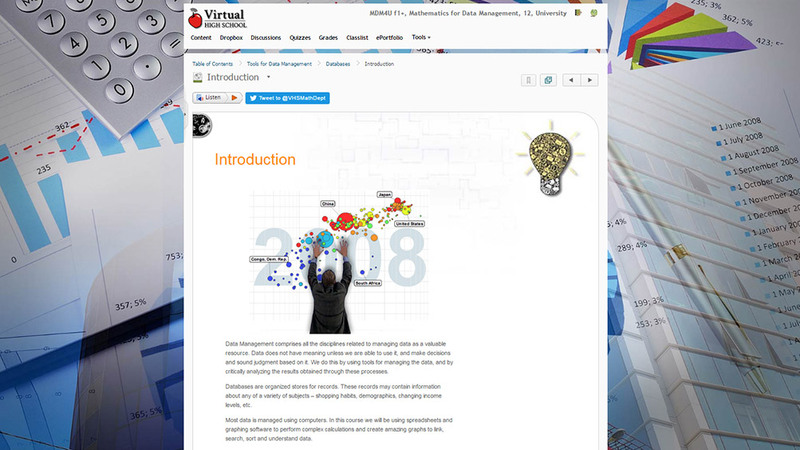 Data Management comprises all the disciplines related to managing data as a valuable resource. Data does not have meaning unless we are able to use it, make decisions and sound judgment based on it. We do this by using tools for managing the data. In this course we will be using spreadsheets and graphing software to perform complex calculations and link, search, sort and graph data. Among other assignments students are introduced in this unit to the Statistics Canada website where they will learn methods of data retrieval and the creation of graphs using CANSIM. This course involves a data management investigative (DMI) that stretches over the first four units. In this unit students will formulate and submit their hypothesis. To summarize data and recognize the trends, we use tables and graphs. In this unit students will demonstrate an understanding of the role of data in statistical studies and the variability inherent in data, and distinguish different types of data; describe the characteristics of a good sample, some sampling techniques, and principles of primary data collection, and collect and organize data to solve a problem; demonstrate an understanding of the applications of data management used by the media and the advertising industry and in various occupations. The DMI continues in this unit and students use statistical skills to appropriately collect and record information. This unit will focus on the analysis and presentation of one-variable data. Students will process raw data and develop the skills to summarize it in terms of central tendency, spread and distribution. Students will analyze, interpret, and draw conclusions from one-variable data using numerical and graphical summaries and explore methods of describing a single piece of data in the context of a wider data set. Students use a variety of different software to analyze the presentation of data that has been collected and processed by others. They develop the critical thinking skills necessary to interpret and assess the validity of secondary data and conclusions drawn from it, maintaining an awareness of the possibility of bias and misrepresentation, either deliberate or accidental. Students submit the third part of their DMI where they process and analyse their individual data sets. Two-variable statistics are the basis for many decisions personally and as a society. Although most two variable statistical tests are beyond the scope of secondary school math, this unit will examine some of the basic topics in two-variable statistics. Two-variable statistics provide methods for detecting relationships between variables and for developing mathematics of these relationships. The visual pattern in a graph or plot can often reveal the nature of the relationship between two variables. In this unit students will analyse, interpret, and draw conclusions from two-variable data using numerical, graphical, and algebraic summaries. Students complete the last part of their DMI where they perform analysis of the relationship between the sets of their information, and use critical thinking skills to formulate a final conclusion relating to their initial hypothesis. Combinatorics is the branch of mathematics dealing with ideas and methods for counting, especially in complex situations. The techniques and mathematical logic for counting possible arrangements or outcomes are useful for a wide variety of applications. A computer programmer writing software for a game or industrial process would use these techniques, as would a basketball coach planning potential line-ups for a game, or a school board trying to make the most efficient use of its buses. Students will investigate the concepts of combinations and permutations. They will consider situations in which each should be used, and develop the skills to be able to determine which is most appropriate. Probability was first studied mathematically in the 17th century when Pierre de Fermat and Blaise Pascal attempted to analyze problems associated with gambling. Modern probability theory grew from their correspondence. In this unit students will solve problems involving the probability of an event or a combination of events for discrete sample spaces; solve problems involving the application of permutations and combinations to determine the probability of an event; demonstrate an understanding of discrete probability distributions, represent them numerically, graphically, and algebraically, determine expected values, and solve related problems from a variety of applications. Students will solve problems involving the probability of an event or a combination of events for discrete sample spaces; solve problems involving the application of permutations and combinations to determine the probability of an event; demonstrate an understanding of discrete probability distributions, represent them numerically, graphically, and algebraically, determine expected values, and solve related problems from a variety of applications. Students will gain an understanding of continuous distributions, and will investigate different shapes of distribution, considering situations that may generate them. Students will explore the normal distribution in detail, and investigate its many applications. They will make comparisons between the normal and binomial distributions. They will form an understanding of the conditions in which they might be used interchangeably, and develop the skills that will allow them to decide how and when to make use of these properties. A2 solve problems involving the application of permutations and combinations to determine the probability of an event. B2 demonstrate an understanding of continuous probability distributions, make connections to discrete probability distributions, determine standard deviations, describe key features of the normal distribution, and solve related problems from a variety of applications. C2 describe the characteristics of a good sample, some sampling techniques, and principles of primary data collection, and collect and organize data to solve a problem. D2 describe the characteristics of a good sample, some sampling techniques, and principles of primary data collection, and collect and organize data to solve a problem. D3 demonstrate an understanding of the applications of data management used by the media and the advertising industry and in various occupations. E2 communicate the findings of a culminating investigation and provide constructive critiques of the investigations of others. Problem solving: This course scaffolds learning by building off of skills learned in each unit. Students will work on a single project across multiple units, applying what they have learned in each unit to further analyze the data they have collected. The course guides students toward recognizing opportunities to apply knowledge they have gained to solve problems. Connecting: Students will connect concepts learned in this course to real-world applications of statistics and probability through investigations and assignments. Self-Assessment: Through the use of interactive activities (e.g. multiple choice quizzes, and drag-and-drop activities) students receive instantaneous feedback and are able to self-assess their understanding of concepts.